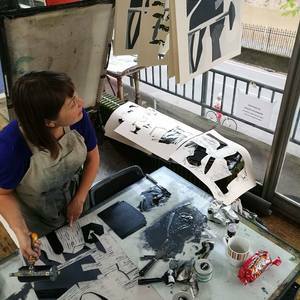 I am a Bristol based printmaker who predominantly makes linocut prints. In my work I design iconic images from my everyday, paring down subjects so that they become pattern-like. I am influenced by Modern British prints such as those made at the Grosvenor School in the 1930s, as well as ukiyo-e prints from Hokusai and Hiroshige. Royal Society of Marine Artists Annual Exhibition, Mall Galleries, London, 4th - 14th October.